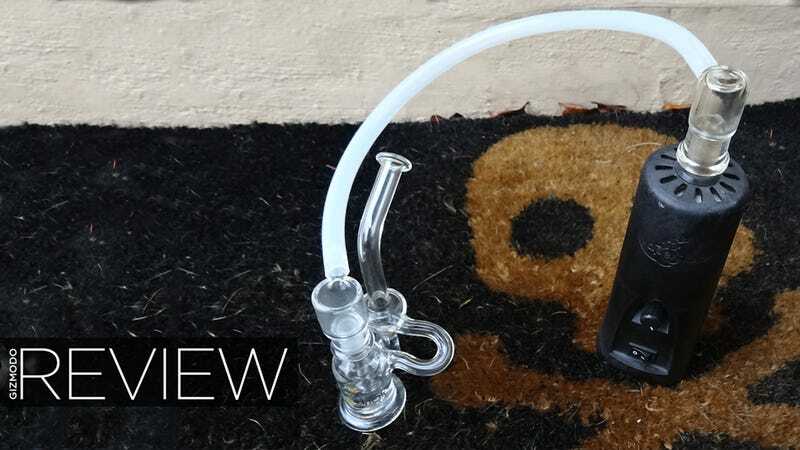 VapeXhale Cloud EVO HydraCycler Review: It's Fan"dab"ulous! Don't get me wrong. I'm not saying that I love the new "HydraCycler" attachment for the Cloud EVO vaporizer. I'm just saying that I don't know how I ever lived without it. The Cloud EVO tabletop vaporizer from VapeXhale has already earned high marks for consistent performance and minimalist styling. However, the EVO does have a nasty habit of tipping over, especially when capped with its top-heavy bubbler attachment (aka a HydraTube). Even when it does stay upright, I find it awkward to draw from unless I'm standing up and holding the thing in both hands—one on the base unit and one on the HydraTube. But the HydraCycler isn't like the other conventional HydraTubes. It's really more like a complimentary device than an "attachment." It doesn't sit directly atop the base unit as other hydratubes do but is connected by a length of rubber tubing. This allows you to leave the base unit on the table, where it should be, while holding the HydraCycler comfortably in your hands. When used in this manner, the HydraCycler really does just act as a mouthpiece and bubbler—the loose-leaf crucible or VapeXnail wax tubes are loaded into the the base unit for heating and the resulting vapor travels through the tubing and into the HydraCycler where it is purged through a water bath and inhaled into your lungs. But what's really slick is that the HydraCycler doesn't actually need the electronic base unit to function. It can easily be converted from EVO mouthpiece to standalone dabber bong. All you do is remove the tube adapter from the HydraCycler's down stem and replace it with the included glass nail (which holds the hash) and dome (which collects the vapor) that you see to the left. A small amount of hash sits atop the nail and is vaporized either by the tip of a hot knife. Of course the HydraCycler, like the rest of the Cloud EVO system, does not come cheap by any means. It retails for $220 if you buy it separately from the $500 starter kit. The VapeXnails are another $50 a pair and the tubing with adapters is $60. Luckily it looks like VapeXhale is currently having a "fire sale" on the HydraCycler bundle wherein you can buy a starter kit and get the HydraCycler for free. "Just use the code "RECYCLE" ($220 off) when you check out," reads the company's website. There's also still the issue of tippage. Unfortunately the Hydracycler is just as susceptible to tipping over as the EVO itself, especially when tethered by the rubber tube. Even when loaded with water, the hydracycler is simply too light and has too small a footprint to stay upright unless set down veeeeery gently. Despite its drawbacks, the HydraCycler is a potent addition to the Cloud EVO system and well-worth the $220 price tag.